Here in Switzerland, we had some great news over the summer. 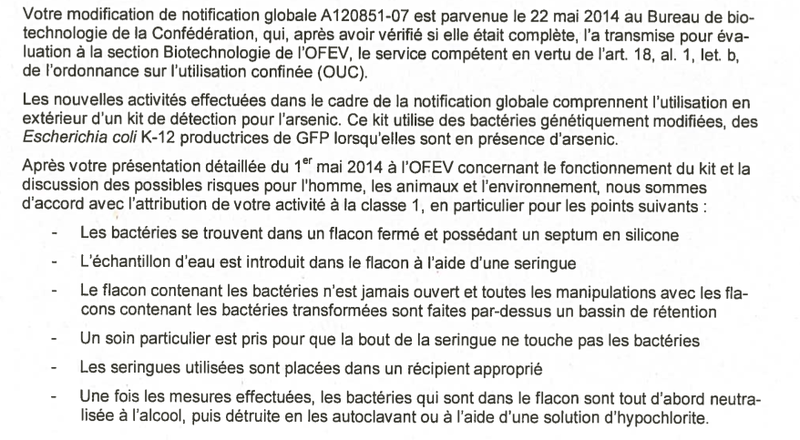 All of the work of Bastien and Falco from the spring semester, with the support of Dr. Leuenberger of the Biosafety Office of EPFL paid off – and we have our notification A120851-07 Recherche en sciences de la vie approved by the Swiss Federal Office of Environment. This is great motivation to finish calibrating the prototype with the same vials from ArsoLux: A PTFE/silicone septum capped vial. The safety assessment presentation of Bastien and Falco (also on the page above) can be found here as a pdf file : Pdf presentation).